When I was a child, I wouldn’t eat anything that I thought was too “weird,” at least to my American sensibility. Of course, natto fell into that category. For those of you who don’t know, natto is fermented soybeans. Yes, fermented. It sounds about as appetizing as it looks and smells. My first generation mom used to say that “real” Japanese people eat natto. I think it was just a trick to get me to try it, but either way, I took it to heart and eventually gave it a shot. The odd thing was that I actually liked it and it had the added benefit of making me feel as though I was a “real” Japanese–whatever that means. While eating natto the other day, I started thinking about Japanese food. I was lucky enough to have a mom that cooked authentic Japanese food that her mother had taught her how to cook. It wasn’t until I started eating in LA’s Little Tokyo did I realize that what other people thought of Japanese food was different than I what I knew. Let’s set the record straight, anything called teriyaki is not Japanese food. You could say it’s as Japanese as Del Taco is Mexican. Ironically, the first time I tried teriyaki sauce I thought it was Chinese. I don’t hate teriyaki, but I don’t love it either. I have come to accept it as an American dish. I feel lucky that I can tell the different between real Japanese food and the American imitations. However, what I am worried about most is my future children. Will, they be able to tell the difference too? Does it even matter? It scares me to think that my future unborn children will prefer hamburgers and hot dogs to a good Japanese dinner. It concerns me to think that they’ll never try natto and think that teriyaki is Japanese. Maybe I should hire my mother to cook for my family full time and I will force my children to eat the food whether they like it or not. That may sound extreme but for some reason I feel as though if they are accustomed to their cultural food early they will be tied more to their culture. I guess that’s what alarms me the most: the loss of my children’s culture, the loss of their roots and the loss of a tie to where they originally came from. I know I’m being ridiculous and dramatic. I can almost see my wife rolling her eyes and shaking her head. She would probably say that I don’t eat like a Japanese person anyway, so why am I so worried about my children? I should explain. When we eat fish, my wife eats the entire fish. Picks off every piece of flesh from the head to tail, including skin, bones, eyeballs. Okay, she doesn’t eat the eyeball but my stepfather from Hiroshima claims that it’s the best part. I’ll just have to trust him on that one. But my wife brings up a good point; people from the rest of the world don’t waste any part of the animals they eat. They literally eat every everything. Americans on the other hand only eat the parts that we’ve grown accustomed too. I’m no different. I eat like an American when it comes to fish and deep down, I know it’s wasteful. I hear the part of the fish that is best is the part near the cheeks but I can’t get myself to eat it. My wife is right. 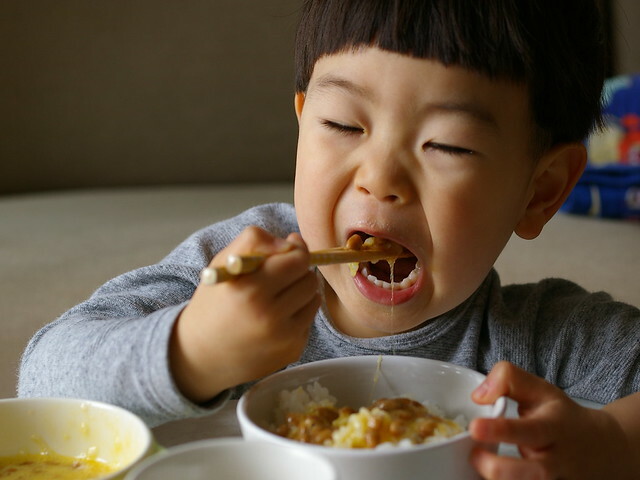 I suppose though what frightens me about my children not knowing Japanese food is not just the loss of their culture but also a feeling of shame that often comes from not knowing their culture. When I was in grade school, my mom used to pack me a lunch box with onigiri, or rice balls with tasty treats in the middle. They were really good but they embarrassed me. I wanted the peanut butter sandwich and potato chips that all of my non-Japanese friends were eating. Now, of course, I’d kill for the onigiri lunch but that’s only after I realized that being different was okay. It took years and years for that to happen. I don’t want my children to ever feel that being different is bad. I want my children to be proud of the food, the culture, everything that comes with being of Japanese ancestry. I know deep down my children will be American, like I am American. But is it wrong for me to hope that they’ll be even more Japanese than me? Maybe I’ll serve them natto before they know not to like it. Heck, maybe I’ll make sure my wife eats lots of it when she’s pregnant. For some reason, I think she’ll be okay with that.